Liz was the founder of the Mangawhai Zonta Club. She arrived in Mangawhai in 2005 and has lived in Mangawhai for 11 years. With her husband Les, purchased Tara Estate which they turned into a hive of activity, growing tamarillos, making pickles, entertaining guests, catering for weddings and events and much more. She comes from a nursing background and has many talents. She also is dedicated to her children and grandchildren. Liz was previously a member of North Shore Zonta Club and soon set about the huge task of creating the Mangawhai Club in 2007 which was recognised by the District Board in April 2008 as a club in formation. She has now been in Zonta for 14 years, firstly with the North Shore Club & now with Mangawhai. With the help of Zonta Cub of Whangarei the fledgling club had accumulated 10 financial members by the end of the 2007/2008 year. The club was soon thriving and by May 2010 had 20 members and was chartered. 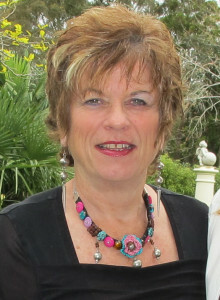 Liz was Charter President of the club in the beginning and served during 2010 – 2012. She has remained very passionate about the goals and vision of Zonta. She accepted nomination for the position and was voted Area 1 Director for the 2014-2016 biennium. She chaired the Conference committee in 2013 but didn’t make the conference due to an accident. Coordinated the 2015 Zonta Says No D16 campaign, and again coordinating in 2016. Liz has attended all area meetings from 2005, most district conferences, the 2006 Zonta convention in Melbourne, and the 2016 Zonta convention in Nice.